Not much has been added since my last note - nothing actually. Therefore let me add new comments on S/Y Lotten. The previous owners told us about the first picture showing Lotten with the narration "Marstrand Regatta" dated 1956. It supposedly shows Lotten sailing a major competition (WC) outside Sandhamn in 1953 - not Marstrand! I once found the results online. She ended among the last contestants. She has a flatish bottom and therefore she never was competitive upwind. The flat bottom was also the reason that she was uncomfortable as a "camping vehicle". It made the cockpit space low beneath the boom. She was in excellent condition during our ownership. The ash ribs and the mahogany freeboard were as new. Regret some changes made later to the open cockpit. Although somewhat understandable as it often got damp inside. I wonder why the excellent backstay system was removed? It was the best I've seen and made her easy to manage single handed. We sailed around a bit - to Finland and touched the southern parts of Sweden. However, Lotten was probably more suited, maybe even the perfect vessel for a day of pleasure sailing. This is somewhat a test and my first posting. I co-owned SY Lotten three sailing seasons 1982-84. She was purchased from two young brothers with surname Björk (i think). They were very skilled and competitive sailors who wanted to move into a different class of sailboats. They eventually bought a 5O5. They perceived Lotten as not fast enough to compete with new designes of R5.5. I remember her well and saw her last time about 1996 when she was for sale at Bosö yacht club on Lidingö, outside Stockholm. A gentleman who actually worked at the Bosö wharf took very good care of her. Actually regret very much not buying her back. SWE-019 Lotten has a new sail number, FIN-51. The boat arrived to Helsinki, Finland the 13th of June. SWE-019 Lotten was sold to Patrik Cederberg in Finland in May 2010. The boat will be participating in the World Championships in 2011. Lotten means "lottery-lot" but it is also a girls name in Sweden - a shortname for Charlotta! The earlier conclusion on S-19 having been a lottery boat in 1953 is herewith corrected; Helena Thorslund and Jens Busch had also given such hint to the name question. As far as the boatyard is concerned, the 1955 measuring certificate, which can be seen in "Documents", is stating Svinevikens Batvarv. Hakan Martinsson had helped to find that original certificate and he also confirmed that the neighbouring Arvidssons yard (Svinevikens batvarv) had built her; hence the data as currently stated. Other info + images from the Marstrand Regatta 1956 have been supplied by Ralph Sundborn, who has raced "Lotten" as foredeck-man in the mid-end 50's (1955 to 1961) together with Gunne Dellborg (Skipper) and P.O. Mattson (midship). GKSS:s lottery boat 1951 was won by Dan-Axel Broström, who purchased hundreds of lots to sponsor his club GKSS, where he was a board member at the time. This boat, GKSS 1951, was later named Lotten. In 1953 he hed a new boat built, S19, also named Lotten. This boat was raced by his wife Ulla and others. S19 was built by Bröderna Martinsson (not Arvidsson) in Svineviken. They built most of the 5.5 metres designed for clients in Gothenburg. I purchased Lotten in 1973 and sailed her, alas, for only two summers. I sold her in 1975 to Mr Agne Holmer who kept her for one year before passing her over to Mr Peter Printz. When owned by me it was in ´original´ condition, no deck house or anything. The mast had been moved forward appr. one foot, prior to my ownership. 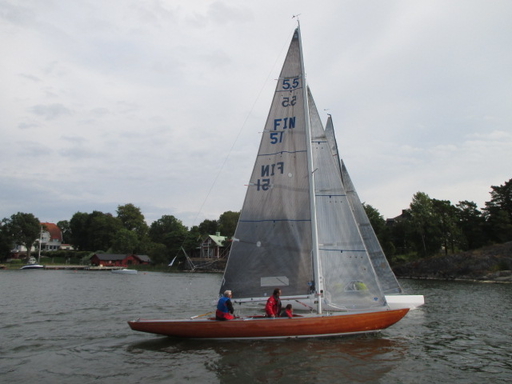 I was informed by Mr Sture Sundén, son of the designer of the Folkboat and born and raised in Gothenburg, that Lotten was the second boat with this name and built by Broström for, and raced by, his wife in the 1950s. It has been common in Sweden to finance a race boat by a club lottery. In 1953 the GKSS of Gothenburg chose a 5.5 to be built and the boat was consequently named "Lotten", meaning "lot". The winner Dan Axel Boström, a commercial ship owner, had her being sailed by youngsters ot he local GKSS club. In the 60's Lennart Klein sailed her in the Stockholm archipelago and in 1966 for the World Championship she apparently lsot her wooden mast in the 3rd race. Then Kungsörs built a new aluminium mast, whihc we are still sailing today (sometimes I wished to have a lightweight alu mast from the 80's, tough). In the 70's to 90's she was used aas a pleasure boat, got a deckshouse, berths and other "niceties". The deckshouse was removed and after her arrvival in Germany in 2002 we took of all what was not original and brought her back to almost original condition. By the time we got orignal photograohis of her deckslayout, we had made our peace with the double cockpit, which we had reckoned to be orignal, but you cant get it all right. She got a few ribs reinforced, main ribs replaced and the mast removed to original position and she is today racing in mid- to end-field positions in Yardstick and 5.5 races, but: She is a pure joy to sail and watch. Family Arvidsson owned this boatyard in Svineviken on the island of Orust, in Bohuslän, Sweden. The Yard is till there, but it has been closed some years ago. Historie / Besonderheiten: In Schweden war es üblich, einmal pro Jahr einer Bootsklasse zu einem neuen Regattaboot mittels Lotterie zu verhelfen. In 1953 war die gewählte Klasse beim GKSS in Göteborg die der 5.5er, das Boot hieß folglich „Lotten“. Gewonnen hat sie der Reeder Dan Axel Boström, der sie von jungen Mitgliedern des Clubs segeln ließ. So wurde sie von 1953 bis Anfang der 60er Jahre aktiv beim GKSS in Göteborg auf Regatten bewegt; danach, vom neuen Eigner Lennart Klein in Stockholmer Gewässern. Letzte WM Teilnahme in 1966 in Kopenhagen, ausgeschieden nach dem 3. Rennen, nach Mastbruch. Danach gab es einen neuen Alu-Mast von Kungsör’s, den wir heute noch segeln. In den 70er bis 90er Jahren war sie "pleasure Boot" in den Ostschwedischen Schären, bekam ein Deckshaus und Kojen unter Deck. Das Deckshaus wurde bald wieder zurückgebaut; nach Ankunft in Deutschland wurden dann noch ein Schiebeluk und zwei Decksluken sowie die Kojen entfernt. Die Yachtwerft Glückstadt erneuerte einige Bodenwrangen im Heckbereich und der Ruderkokerbereich wurde gedichtet. Daran schloss sich die Rekonstruktion des Decks an, die Ruderaufhängung kam in V4A neu, diverse Spanten wurden geschäftet und der Mast wurde auf seine ursprüngliche Position zurückgebracht. Zwischen den winterlichen Restaurationsarbeiten wurde und wird das Boot aktiv auf Elbe (Yardstickregatten) und Ostsee (Klassiker Regatten und DM der 5.5er) gesegelt.